The sun was low in the sky when I photographed the Frontier Drive-in near Antonito, Colorado. Defunct along with the closed theatre was this line up of decommisioned trailers; four of which were gleaming aluminum. 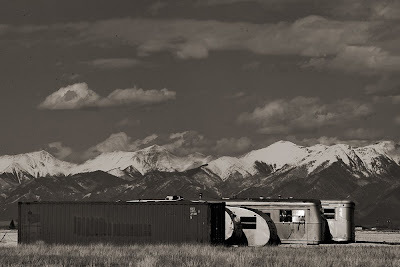 Their reflective surfaces punctuated the scene as the 14,000 foot Sangre de Cristos rose above the San Luis Valley.